Our client gave us an almost impossible mission: find an apartment that can serve as a pied-à-terre for his family of 3 children, compact (without any space lost), in an old Parisian building and with an elevator…and with…a view of the Eiffel Tower! After long months of research, lots of disencouragement, ridiculous prices, worthless visits, we found the needle in the haystack! This apartment was partially, however badly done, renovated and will be entirely renovated soon.. The view- is simply perfect! After 8 months of work and renovations, our clients discovered their Paris apartment entirely renovated and furnished by our MGL Renovations & ALC Design team. Featuring a lovely balcony, this apartment is a stones throw away from the Seine and under went a large renovations as well as installment of a high quality integrated AC/forced air heating system and complete rearrangement of the floor plan to re-discover the haussmannien elements and charm that had been hidden. After three months of work and installations, our client was finally able to visit his apartment which was largely renovated and furnished by our team MGL Rénovation/ALC Design. This luminous apartment is situated a stones throw away from the Seine belongs to a Frenchman who uses the apartment as a Paris home. The apartment needed a big style change and to be freshened up, bringing life back into the property and to please our short term rental clientele here at A La Carte Paris. The kitchen and the bathroom were entirely renovated and the rest of the property was refurnished and redecorated. As promised, just in time before Christmas, our clients have taken delivery of their apartment, which was completely renovated and decorated by A La Carte Design. This adorable two-bedroom was found by our team for a family who lives in London but comes to Paris very often, and will eventually come live there. This apartment had great potential with the prime location, as it is situated in the elegant 7th district and just a short walk away from the popular rue Cler market street. After a complete renovation, this perfect family friendly haven is ready for the new owners! Like our client, do you too like the idea of owning a Paris home which brings you pleasure when you’re using it and earns you money when you’re not? If so, then contact A La Carte Invest today to see if you qualify for one of our buy-to-let projects. One wouldn’t have thought that this apartment would be finished in time for Christmas! The work in the apartment that we presented to you in September is advancing well, the owners want to be able to stay here before Christmas so we have put everything in place so that the apartment is ready. Even if you wouldn’t think it by looking at these photos, everything in the apartment will be finished in time! The wall dividing the former dining room and the living room was removed without a problem, and the same was done for the wall between the kitchen and the bathroom. The kitchen was moved into the living room, which required hiding the plumbing in the wall at entrance. The two bathrooms were also put into the space where the kitchen and bathroom previously were. The bespoke cupboards have been built, the original parquet has been sanded, varnished and protected and the walls and the ceilings have been repaired and plastered. The next steps: the painting, the finishing touches and the several deliveries of furniture which has been picked out by our team. Our A La Carte Invest team found a two bedroom apartment, for a family living in London and who will soon come to live in Paris. The layout of the apartment doesn’t waste any space and is situated on a sought after road in the 7th disrict of Paris. The apartment was completely untouched and had a very vintage feel. It was going to need a very large renovation in order to bring it into compliance with standards and to bring it up to date. The parquet flooring and the original fireplaces will be preserved and enhanced. 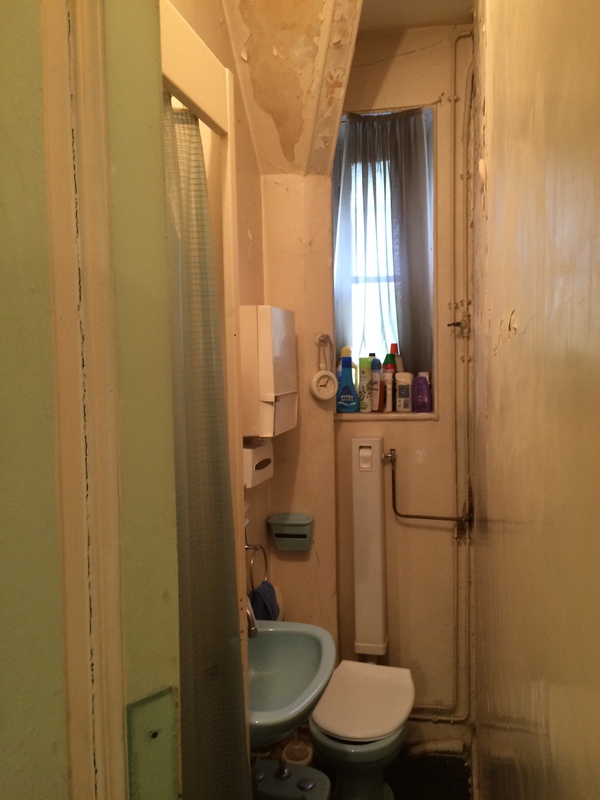 The former bathroom, which was packed into a tiny space, and the former kitchen will be transformed into two shower rooms and the kitchen will be moved into the living area, which will become a double living space once the dividing wall has been removed. This summer our clients have taken delivery of their apartment, which was completely renovated and decorated by A La Carte Design & Invest. This large apartment was found by our team for a French expatriate family, who were looking for a pied-à-terre in Paris so they were able to come and visit their family in Paris and where they would eventually come to live. This apartment has a superb location, situated on a large courtyard with five large south facing windows in the heart of the 7th district. After a complete renovation which was full of surprises (see our previous posts), this large apartment is a haven of tranquility. The apartment, now fully renovated, is exclusively rented through A La Carte Paris. You can view full photos, description and specifications of the finished apartment here.